The Secret of Gothtober’s Music! There are 38 steps up to Gothtober Headquarters, and lugging Jason Pipkin’s drum kit up all of them made us appreciate each and every step even more than usual. We are quite fortunate to have the Electones on board to make beautiful tunes to cruise to as you peruse this year’s Gothtober 2009 calendar. The Electones are, respectively: Jason Myers on Guitar, Mike Bolger on Keyboard, and the aforementioned Jason Pipkin on drums. The boys filled up the living room with all manner of musical gadgets, not the least of which was a fantastic Leslie-style rotating speaker that Jason built and Mike’s lovely electric keyboard made in 1971. Check out what happens when you give the Electones coffee and popcorn and ask them to play some intermission music for the Gothtober Drive-In! 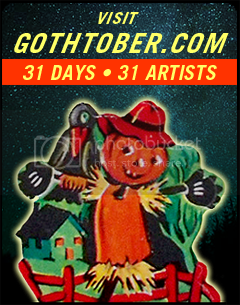 This music will be sweetened and used as the calendar’s main theme… look for it Gothtober FIRST!!! Woooooooo!